What I’ve craved from living abroad is turning my old life completely upside down. Kind of like putting it in a carnival ride with fun wild lights. Maybe that would be a trip to India. I digress. Living in another country shatters your old normal. Instead of picking up Starbucks on your way to the office in Cleveland, you take a metro across the city after downing a tiny-tiny espresso, hear a half a dozen different languages, scan a newspaper which you can’t read, and stick out like a sore thumb. Brilliant I say! Living abroad changes the center of your world. Moving, even temporarily, to another locale, completely changes who your friends are, where you work, the scenery, the sounds you hear in the morning, the smells, what you eat, when you eat, how you interact with people. Take a tuk tuk to the grocery store. Better still, screw the grocery store and head to the wet market. 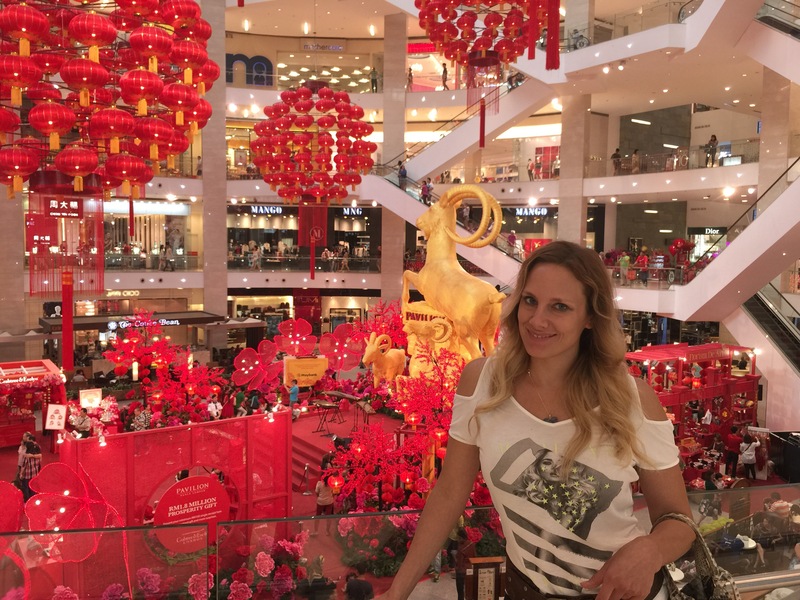 Living temporarily with my husband to Kuala Lumpur was very different than when I lived in England but both experiences changed my world. I got into a traffic jam at midnight because of a 24-hour department sale during Ramadon. I saw black duck offered at the butcher. Our every-day life consisted of seeing little lizards scurrying on walk ways, finding orchids growing wild abundantly on trees, and seeing Chinese lanterns aglow. I was worlds away from my old life. Decorations for the Chinese New Year at the Mall. Turn your world upside down and move, even for a short period of time. Move with your children. They will never forget it. It will change their lives forever. Though, you will have to then face a forever, incurable travel bug. Riding in a tuk tuk in Bangkok. Sounds like you’ve lived abroad??? Yes, I have. It definitely changed me – opened my eyes to many things.